I believe that Malden needs a new name. The prefix "Mal" is associated with everything that is bad. Malnutrition, malaria, malignant, malodorous, malcontent, malicious, and so on. (feel free to contribute your favorite "mal%" word). Swapping out the Ma and replacing it with Be would make something new, "Belden". Ahh. Isn't that better? Belissimo! Actually, you'd want to go from 'Mal' to 'Ben', giving you Benden. This was done in Italy to the town of Benevento, which was previously changed from Maleventum, to Beneventum, for this reason. I've read the original name to mean "bad wind" or "bad event." The people there were thought to be witches or just crazy (hence Liquore Strega, which is made there), or it was the place of a bad event, depending on what you read. When I visited, it was described to me to be like "your Salem Massachusetts." This doesn't seem like an appropriate place to plop a minor league team. It makes more sense for them to be in smaller stand-alone cities, such as Lowell, Worcester, Springfield, Nashua, Manchester, Concord, Portsmouth, Portland, Providence/Pawtucket, Hartford, New Haven, Stamford, etc. Even people from right next door, such as Everett, Medford, or Melrose, would likely identify with Boston over Malden. I can't see people supporting a team here. We already have the Red Sox. Now in their 15th season. . . Larger: pop. 95,000 vs. 60,000. Long and star-studded legacy as a distinct sports town in its own right. Damn near everything in town is named after hometown hero Rocky Marciano...and they've produced more major pro athletes than nearly any town in MA (just look at all the sports stars on their "Noteable People" wiki listing: https://en.wikipedia.org/wiki/Brockt...Notable_people). Brockton High School's a perennial football powerhouse, and there's a vibrant amateur boxing scene. It's tough to find a sizeable place in the state that's more ideally receptive to minor-pro and non-collegiate amateur sports than that. I'm really not sure there's any place closer to Boston that's got this prominent a native/organic hook to it. Demographics ideal for selling minor pro sports tix. It's a middle-low income town...still lots of blue-collar workers who can't afford to go to regular games at Fenway. Very ethnically diverse...majority-minority. Large African-American, Hispanic, Cape Verdean (largest concentration in MA) population. Large 1st/2nd-gen immigrant population. These demographics lend themselves to a broader sports palate than the upper-income, mostly-white demographics in the inner Boston 'burbs, where an affordable local minor pro team right in their neighborhoods is an ideal first reach for getting involved in the community. Games are very accessible. Commuter rail stop right at the BAT bus terminal, only a few minutes on very frequent local buses to the stadium. Stadium right by a Route 24 exit. They end up drawing a pretty wide catchment from surrounding towns because of ease of access. Obviously Malden has great access too, but given Brockton's other self-identity and demographic advantages for supporting a team it's no small feather in their cap that they have generally excellent public transportation (and arguably the best non-MBTA bus system in the whole state). Those are more the kinds of places ripe for seeding a minor pro team. Obviously biggest satellite cities like Lowell and Worcester have their proven track records, especially with AHL hockey (ditto Springfield which is one of the oldest AHL markets of all). But if you're looking for sitings of semi-pro and deep-minor pro teams in tertiary cities and 'burbs a step below the Lowells and Worcesters, you really need to work from some pre-existing momentum. At the very least passing the high school sports patronage litmus test with superlatives and having some sort of longstanding above-average appetite for local sports. Otherwise it's too much a shot in the dark for too low-margin a venture to not have the likes of a Brockton townie culture putting wind at the team's back from Day 1. Malden really doesn't stand out from the crowd in the regard, and is gentrifying with more residents whose lives are tied to the Boston CBD so it doesn't encourage new generations of townies quite like it used to. There's no doubt a market for more teams like the Rox in various sports in other 128-to-495 belt suburbs. Just really not sure they're picking the right place with this proposal. Affiliated baseball changes everything, especially since this project was floated independent baseball in the northeast has been dying. Also note above, Brockton Rox are now a summer collegiate team, meaning they are no longer professional. I'm glad they're still building the stadium, but I would have liked to have seen an independent team. I think they're going to have a pretty uphill battle anyway. What baseball club will put a minor league team in a suburb of a different major league city? Actually, I'm not sure they even could do that, given the Red Sox "territorial" rights to Malden. 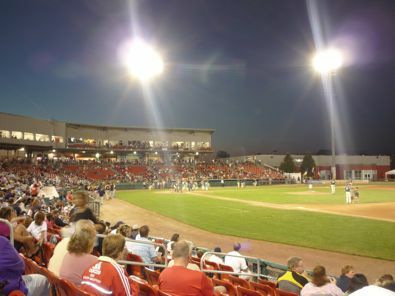 The Sox aren't going to be the team, since they own the Salem Red Sox in Virginia and have a very strong relationship with the Greenville Drive (the Drive's stadium is 10 years old and was built with Fenway dimensions and a "Green Monster"). They'd need to convince either the PawSox (unlikely but possible) or the Spinners to move. FWIW, I don't think the PawSox are coming to Malden. The proposed stadium is half of McCoy's capacity, though I suppose they could up-size the plan. I feel like it's going to give my computer a virus. I would agree re: an affiliate of another MLB club. Hopefully they keep the Pawsox down in Pawtucket. Somehow I have a feeling the new ownership will try and increase revenue and ruin the experience. A Pawsox game is a perfect way to bring a young kid - under the age of 12 - to see some qualit professional baseball. I find it mildly interesting that both this saga and that of the Wynn casino are (allegedly) on the same timeline--2011 from 2019--if you say the Wynn Boston narrative kicks off with the approval of Vegas-style gambling here, and that casino is supposed to open in 2019. But I say "allegedly" because the casino really does seem like it's going to happen in 2019 based on current construction progress, whereas this project... hm. Clearly, it helps that it is (or at least, was) a political darling, with Coakley having been in the press conference photo, etc... at the same time, the City Council has been expressing extreme reservations, and given that they're the local governing authority that's 'in the trenches,' that may count for more ultimately. Also, whereas Wynn had to negotiate with just 2 parcel owners as far as I know (1 private consortium and the MBTA), these folks have to find a way to buy out maybe 6 or 7 folks (rough guesstimate based on this map), all of unknown disposition relative to the project? Bottom line, I admire their dogged tenacity in pursuing this vision--whether or not it's the "home run" downtown Malden deserves/needs--despite the innumerable trials endured and obstacles confronted... makes one want to paraphrase a similar tale of hardball dreams & adversity. I think a Lynn team would make more sense. Lynn is more distinct from Boston than Malden. Malden is basically a neighborhood of Boston. Lynn is similar to Brockton economically and I think a team could do well there. I know Malden has been building a lot of housing recently and more housing would probably be politically unpopular, but this is right across the street from the Malden T stop. Such a waste of a prime parcel. Lynn's also got more appropriate land for a stadium. The harbor, for instance...where they're trying to get some sort of 'vision thing' going. Ballpark near the ferry terminal with an ocean view would be a choice place to do it, and it won't matter if there's still some scuzzy industrial next door. In addition to the 'Boston appendage' vs. self-ID'd city angle discussed here, totally agree with statler on the siting for this Malden stadium being an egregious waste of a parcel. You can't build something there that's dark 280 nights a year when the city needs housing and 24/7 commercial space that badly. Definitely not with a primest-location site like this. I can't see the Spinners moving, unless capacity is an issue. They sell out every game and are quite the economic engine for Lowell. This is the point I was trying to make (not using Lynn specifically) but you said it better. Brockton is a similar distance from Boston as Lowell is. Malden is right in Boston's backyard. We don't need a minor/independent league team that is practically next door to a major league team in the same sport. When you factor in all the colleges on top of the 4 main sports team (plus the Revolution) I can't see Boston (or the inner burbs, including Malden) supporting another team. Fans don't even fill Alumni Stadium for a "Power 5" conference BC football team. We're spread a little too thin at this point. That's why another city with its own distinct identity would be a better fit for the minor league. The New England minor league teams are already here and unless the Red Sox approve of Malden as the home to a scion of a Major League Baseball team -- it won't happen. The Sox won't permit an American League franchise to establish a foothold within their market which they feel covers all of New England [well oK maybe not Connecticut west of Meriden]. So that means if it was to happen, it would have to be either a Sox minor league team [all taken except for the possibility of the PawSox moving] or possibly they might let a Northeastern City National League Team have a single A team in Malden. But which team -- Mets [NO -- not a chance], perhaps the Phillies or maybe if Montreal gets a Team again.